Of all of the impressive characteristics of Greenwood’s playing, perhaps the most notable is his ability to find space to stake his sonic claim amidst the many sounds going on at any given time within the music of Radiohead. Whether it’s pedal-heavy guitars, wild lead solos, layers of synths, frantic vocals, or polyrhythmic drumming, Greenwood has to be extremely tasteful in choosing where to place his lines, and it’s something he’s superb at. His love for Motown and R&B grooves becomes evident when you break down his playing, though it might seem counterintuitive if you simply graze through the experimental, alternative sound of his outfit. Here are some samples of his work that exhibit his unique playing in some of Radiohead’s most bass-centric tunes from Radiohead’s extensive catalogue. Example 1a conjures the mood of the hypnotic mid-song groove that occurs 2:39 into “15 Step.” Note how Colin stresses the minor third of the G#m chord (Bn) on the downbeat of each 5/4 bar, holding off on the root until the second eighth-note of beat two. Example 1b is modelled on the descending phrase first heard at 2:09, which Greenwood subsequently weaves into the hook from Example 1a. Observe how he utilizes non-chord tones to give the line extra bite, using an open-string Dn as a pick up into the G# that begins the line, then an A# at the end of bar 1 (as part of a 2-fret-wide descending string pattern). Example 2 approximates the sequential phrases that ground the middle section of “Identikit” (starting at 1:56). Dig how Colin balances each measure by initially sounding four repeated notes, which he then balances via a G-string-based D#-E-F# motif—giving rise to some exotic harmonic flavors in the process, such as the G+maj7 (alternatively notatable as B/G) in bar 3. Be sure to damp any wayward ringing tones that may occur as a result of the string-skipping in measures 3–6. Example 3 is reminiscent of the line that first appears at 1:23 in “I Might Be Wrong.” Note the effective use of 16th rests at the start of beats onethrough threeand the savvy deployment of B♮s, which impart a strong Dorian feel. Other points of interest include the use of Drop-D tuning (thus facilitating a meaty low Dat the end each measure), and the subtle refiguring of this initial idea as the track progresses (from 2:08 onward). Example 4 sketches the first appearance of the sparse and haunting bass work that underpins the verses of “Bloom” (0:47). To cop the laid-back phrasing of Greenwood’s chord-tone-based melody, try playing just behind the 4/4 of the main drumbeat—a slightly slippery task in light of the guitar and keys’ thick polymetric morass. 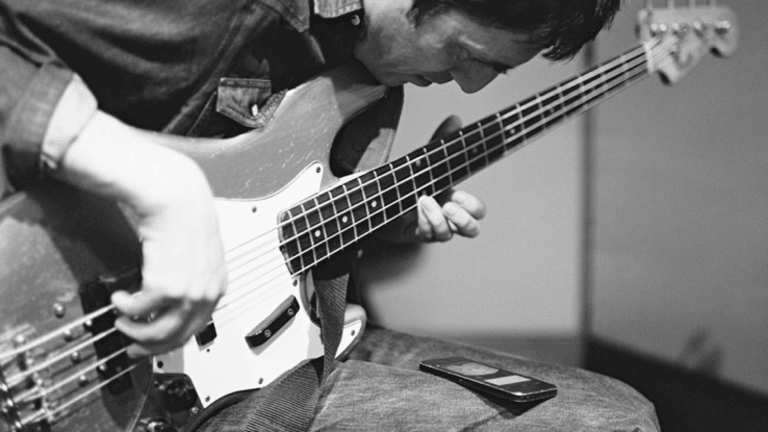 Examples 5a and 5b evoke the main low-end elements of “Morning Bell.” In 5a, Colin uses ghost-notes to help drive the 3+2 feel of the 5/4 rhythm, while in 5b, he uses the back end of each measure to echo Thom Yorke’s vocal melody (A–F#). To help emulate the chiming quality of Greenwood’s phrases in 5b, try letting the notes of each measure bleed into each other slightly. Example 6a is akin to the start of “Weird Fishes/Arpeggi,” where Colin’s ascending, 4th-based line imbues the Em7 chord with a novel tang (0:08). Example 6b, meanwhile, is in the style of the climbing-and-falling phrases from 3:53, which Colin builds upon to anchor the harmonic swirl of the track’s final 1½ minutes. Finally, Example 7 resembles thenimbly fingered lines that appear 2:08 into the band’s celebrated number, “Paranoid Android.” In bars 1–3, Greenwood peppers his part with chromatic approach notes against a 7/8 backdrop, linking the Cchord of beatoneto the A♭chord that falls on the 5th eighth-note (perceived as a secondary strong beat in light of the 4+3 feel of the 7/8 vibe). Note also the use of the 5th (F) over the B♭chords at the end of bars 1 and 3, and the heldover C at the startof the first measure.Though it may appear daunting notation-wise, a one-finger-per-fret approach allows for the whole section to be played with only a single position change (for the 10th-fret F midway through bar 3).